This happy assortment is a clever way to make someone smile! Doorstep delivery makes them even more delightful. 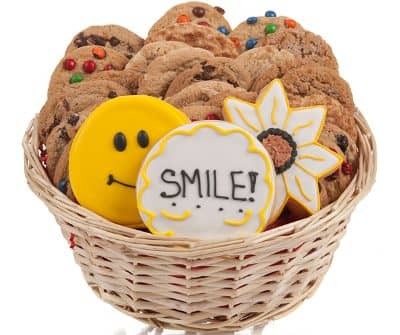 A Smile Cookie Gift Basket is a great way to send a surprise for any special occasion or holiday! Your Smile cookie gift arrives in a gift basket complete with a decorative bow.